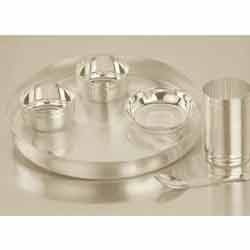 Offering you a complete choice of products which include German Silver Utensils such as German Silver Glass, Dinner Set, White metal Ice Cream fruit Bowls, Bowl Set, Glass Set with Tray, Glass Set and many more items.Our entire product range is acclaimed for optimum quality and durable performance. This Utensils are available for you at just a price which is charged as a Labor in Silver Utensils. We are offering high quality German Silver Cup Plate to our most reliable customers which are situated all round the nation. 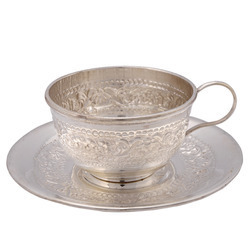 These German Silver Cup Plate are available in market at very competitive and affordable prices. 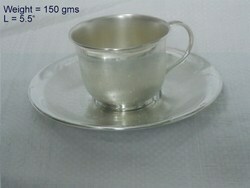 German Silver Cup Plate Set have very nice silver finishing and guaranteed life long silver looks. 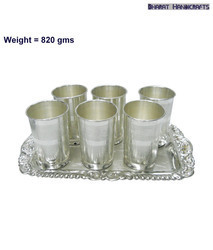 We are one of the renowned Manufacturer and Suppliers of wide assortment of German Silver Dinner Set. 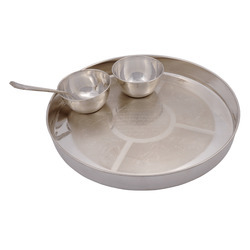 Our Silver Dinner Set are crafted using high grade material at our manufacturer's end. These are available in various shape, sizes and design. These are provided by us at most competitive prices. We are manufacturing a range of German Silver Glass Set. This is absolutely silver finished even the carving is as same as it is in silver products. 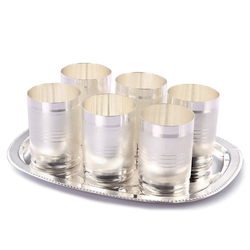 These Silver Glass Set can be used for keeping any desired material and can also be used as showpieces. We make Pure German Silver Bowl Set with Spoon, This looks like Silver for Lifetime even after unlimited washes and Unlimited period of time. 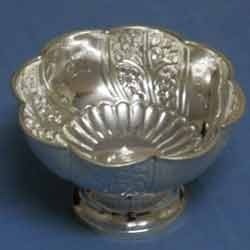 German Silver White Metal Bowl With Spoon with very nice silver finishing and guaranteed life long silver looks. Made up of pure german silver with hand carving on it. The color of german silver is as same as it is of silver so it stays like silver for life time. Its finishing is so fine that no-one can say that this is german silver it looks absolutely like silver. 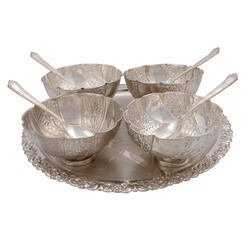 We are offering wide and varied range of German Silver Bowl Set. It has mirror shine silver plating. It looks very elegant. Further, we have a huge distribution network which enables us to make our products reach our clients. We offer our range is different sizes and specifications, which can be customized as per the requirement of clients. Used for the purpose of serving again, our offered range of German Silver Glass Set has been widely appreciated by our varied customer base for its immensely catchy and attractive looks as well as its perfect shine that makes the whole serving experience completely traditional. 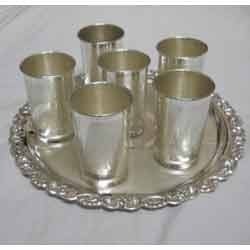 This Silver Glass Set has been made of antique silver finish and the white metal looks makes it look although more royal and a must have collection. We are offering these to our customers in a very comprehensive range. Glass and Bowls available in many sizes with trays and spoons for 2,4,6,8 as per requirement. We are manufacturing a range of German Silver Ice Cream Bowl, Glasses, Trays, Dinner Sets. This is absolutely Silver Finished even the carving is as same as it is in Silver Products. 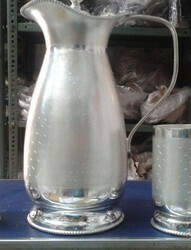 We are manufacturing German Silver Glass Set and more utensils. We make Utensils in Pure German Silver that Looks like Silver for Lifetime even after unlimited washes. Packing available in Velvet Boxes on requirement. Packaging Details: Fantastic Export Quality Packing. 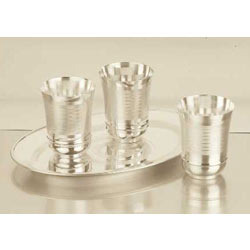 Our company has been widely applauded for its excellent productions, one such production being the German Silver Glass Set with Tray, this range has been manufactured with a strong structured frame work to safeguard the fragility of the glassware. We offer this set with a careful deliver system to provide our customers with the exact product. These Silver Glass Set With Tray are rich in attractiveness and a made to be the cynosures of the arena. We provide this range at the most comprehensive prices to our customer. 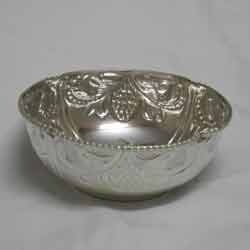 We are one of the leading manufacturers & suppliers of huge range of German Silver Round Bowl. Our product is designed by a team of skilled artisans, using premium quality raw material that is procured from the trusted vendors of the market. These bowls are of optimal quality and have flawless finish. Our range can be availed in different shapes, designs and sizes. This German Silver Bowl can be used as decorative or gift item. This Item is Used for Tilak and Pooja on several Occasions like Rakhi, Plates and Katoris are available in Many Sizes. 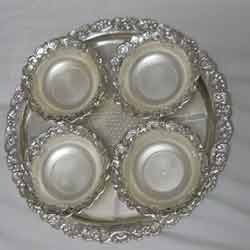 Plates - 6" - 12"
Katori - 1.5" , 3.5" , 4" & 5"
Our customers can avail from us superior quality German Silver Bowl with Tray. 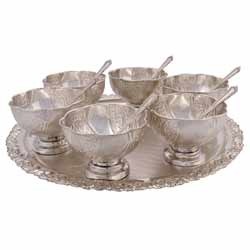 These German Silver Bowl Set are procured from most trusted and reputed companies that are always preferred to supply flawless and standard products. These products are available in market at most economical rates.